Welcome to the articles section of our web site. 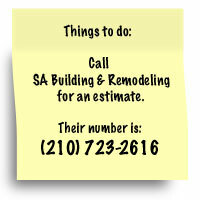 Our goal is to help you become familiar with home improvement news and consumer tips. Many articles have been written in Sunday's Express-News real estate section and the San Antonio Construction News (an industry newspaper) but we are in the process of posting those articles here. Please check back often for more articles on home remodeling topics. Remodeling? There are ten things you should do in preparation.